A new deal signed to the satisfaction of all. For better or for worse, sport, politics and big business are closely linked. Nowhere is this more apparent than around sport mega-events, where political and economic agendas are omnipresent. 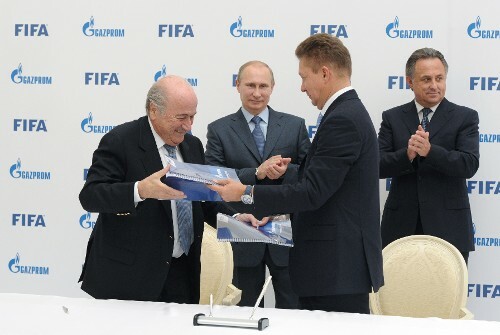 Between Sochi and Rio de Janeiro, the year 2014 has again provided ample illustration for how the immense social reach of sport is instrumentalised for global soft power politics but also for domestic political choices in favour of neoliberal policies, often to the detriment of social, environmental and urbanistic sustainability. But what does ‘maintaining its neutrality’ really mean? Decisions made by sports governing bodies are never neutral: whenever they attribute a major event to an applicant federation (behind which there is invariably a political leader), they either give in to the attempts of instrumentalisation by big business and politics or, at very rare moments of courage, make a political statement which by definition cannot be neutral. Last week a coincidence of calendar gave, once more, evidence for the fact that the claimed neutrality of sport governing bodies inevitably comes out as fake neutrality. While Ukrainian top-club Shakhtar Donetsk is forced, for reasons known to all, to play this week’s Champions League fixture against FC Porto in Lviv (situated 1 200 km from its home stadium, the Donbass Arena, which was badly damaged this summer), the UEFA Executive Committee decided to award four matches of the European Championship 2020, to be held in thirteen different cities across the continent, to Saint Petersburg. Are the members of the Executive Committee only aware that they are sending out a message? True, they were hostage to a self-imposed geographical balance for this event, which forced them to select bids from the regional zone called ‘East’, and Minsk would hardly have been a better choice in political terms. But would it not have been possible to exclude Russia and ‘satellite’ states politely from this bid on the ground that Russie will already host the 2018 World Cup, with matches dispesed all across its huge territory? Of course, it would have been possible. Just like it was possible, as Middle East expert James Dorsey has convincingly argued, to persuade Turkey behind closed doors to withdraw its initially well-considered application because of what had happened during the Gezi park protests. What does Saint Petersburg have that Istanbul does not have? The answer is: Gazprom. And the dozens of million Euros it bestows upon both UEFA (as partner of the Champions League) and FIFA (partner of all competitions 2015-2018). Money that prompts sport leaders to continue ‘business as usual’. UEFA, sadly, missed an opportunity to show boldly that they are not. (1) Speech held at Incheon, South Korea, on the occasion of the Asian Games.